Dane County Sheriff's Office Rev. Joseph Gibbs Clauder, 64, allegedly fondled a teenage girl in Stevens Point and at her Monona home in 2003 and 2004, then threatened to sue the girl and her cousin for slander to stop them from telling other people about the incidents, according to a criminal complaint. Did a Madison priest fondle a teenage girl in her home in 2004, or are false memories brought on by years of mental health problems to blame for the accusation? That's what a Dane County jury will sort out this week as it hears testimony in the case of the Rev. 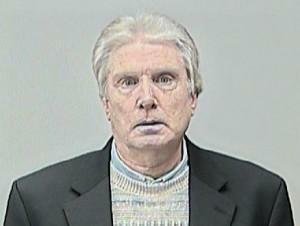 Joseph Gibbs Clauder, 65, who is charged with sexual assault of a child under the age of 16. The young woman, who was 14 at the time and is now 22, testified Tuesday about three alleged incidents involving Clauder, whom she has known since birth. The incident for which Clauder was charged allegedly happened in April or May 2004 when Clauder came to her home in Monona while she was alone, got her to her bedroom under the pretense of a tour of her parents' home and fondled her pubic area over her clothing. "He said it was OK, we loved each other," the woman testified. But she said that Clauder told her that if she told anyone God would be angry and she would go to hell. The alleged incident happened just months after a similar incident at a hotel in Stevens Point during a family gathering, one that was witnessed by the girl's cousin, the girl testified. She said that during a third incident, in July 2004 at her home in Monona, Clauder exposed himself to her. She said she didn't tell anyone because she thought nobody would believe her. "I really wanted to tell because I didn't want it to happen again," she testified. "Because I was scared that I'd go to hell." Clauder's trial is slated to last through Friday. Because of the alleged abuse, the woman testified, she suffered from depression and other disorders and was twice hospitalized after talking about suicide. But according to medical records that Clauder's lawyers, Stephen Eisenberg and William Smoler, presented during cross-examination, the girl had told therapists in February and March 2008 that she had been molested by Clauder as an elementary school-aged child, and that her mental health issues were related to incidents that happened when she was 10 years old. The woman said she didn't recall saying that. She also told a doctor that she had attempted suicide twice, including once in eighth grade, well before her first alleged assault by Clauder in December 2003. In his opening statement, Eisenberg told jurors that the incidents in 2003 and 2004 are the result of false memories that formed in the girl's mind during mental health treatments, augmented by psychology classes she took in school. But Dr. Anna Salter, a consulting psychologist testifying for the prosecution, said that she saw nothing in the medical records to indicate the girl has false memories.